While the immune system makes a significant effort to fight HIV, the virus is still able to replicate and spread efficiently, infecting about two million people each year. This success can be explained in part by several viral factors that trick the immune system. These include four 'accessory proteins' - Vif, Nef, Vpr and Vpu—that help HIV to persist at high levels in the body. 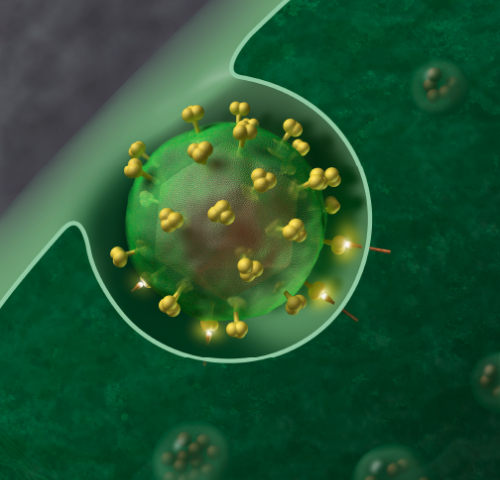 "It was already known that Vpu uses a couple of techniques to suppress the immune response to HIV infection. But accumulating research has suggested that the protein plays a larger role by inhibiting the activation of other proteins called transcription factors," adds co-author Kristina Hopfensperger, Ph.D. student at Ulm University Medical Center. "We wanted to gather more insight into the mechanisms used by Vpu to achieve this." Their results first revealed that Vpu suppresses the activation of a transcription factor called NF-κB—a 'master regulator' of immune activation in infected individuals. As a result of decreased NF-κB activity, Vpu reduced the production of several cellular factors that play key roles in the antiviral immune response.